Established in 1947, Douglas McGibbon & Company are still an independent family owned company, priding ourselves unapologetically for taking an old fashioned and artisan approach to our Scotch Malt Whiskies. We select only the finest casks which have been lying untouched in cold, dark and damp Scottish warehouses for many decades. Douglas McGibbon´s Clan Denny range is home to Single Grain and Single Malt Scotch Whiskies and Blended Scotch Whiskies. 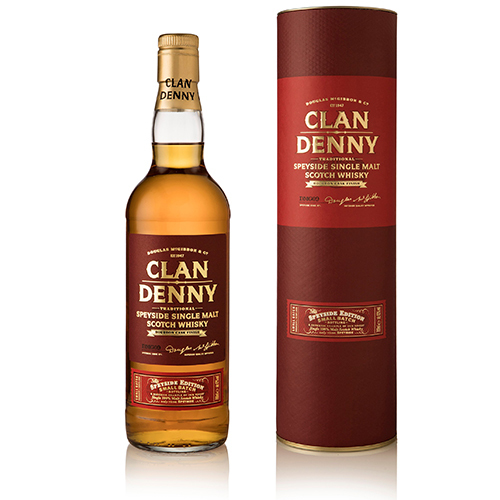 Part of our Clan Denny Regional Malts range, our Clan Denny Speyside Single Malt Scotch Whisky presents a superior example of a Bourbon Cask finished liquid from an undisclosed Speyside Distillery. On the nose detect a set of rich Malty vanilla´d and fresh oak notes, plus summer berries and freshly sawn wood. On the palate, it is above all rich, round, vanilla´d, toffee´d and oaked, with a satisfyingly sweet and long finish.